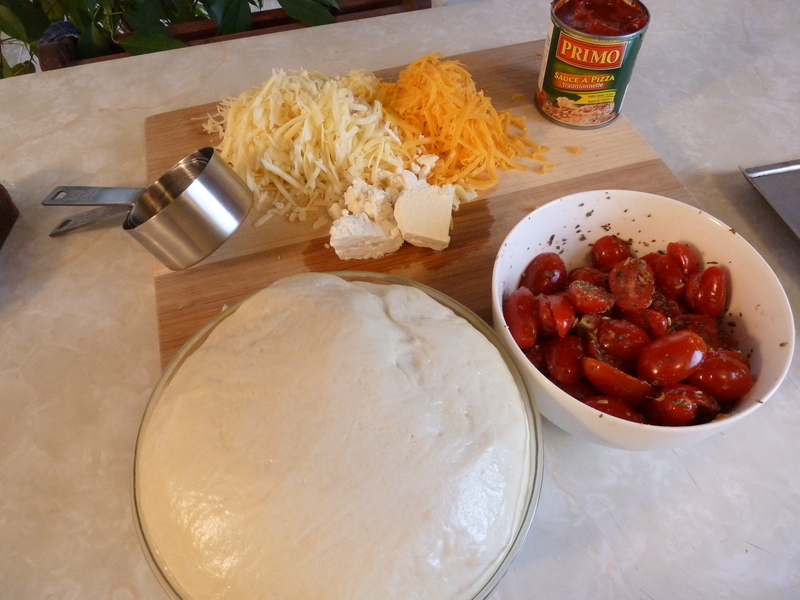 That is pizza dough, risen to the perfect height, some grated cheese, and grape tomatoes, sliced and tossed with garlic, basil, oregano and few fennel seeds. Mix a bit, then turn out on floured surface and knead until dough is smooth and gorgeous. Plop dough in an oiled boil, cover with towel or plastic wrap, tuck in cozy corner of your kitchen for as little as 5 minutes, or until your ready (I’ve left it to rise for as long as 45 minutes). Take dough out of bowl and squash flat on an oiled/buttered pan (I use a cookie sheet). Add toppings until you have something that looks like pizza. Bake your creation in a hot oven (I use 475F) for a minimum of 8 minutes – up to 15 minutes – depending on how crispy a crust I want – watch carefully, as every oven is different. This makes enough dough for two regular sized pizzas using the standard pizza pan. I put the entire thing on a large cookie sheet. You could also split the dough and freeze half for future reference. It can take time to get the dough right. I’ve always been too impatient to knead it properly. But when I finally took the time to knead it until I achieved the perfect texture, I nearly wept with joy. The dough was so lovely to work with I could see instantly why people love baking bread for fun. The truth is though, you can’t really screw up pizza dough, so please give it a try. i would LOVE a lesson…i would happily provide the groceries if you would tutor me in proper pizza production! ps…i LOL’d at your twitter re: paul plakas….i am usually eating bags full of gummy’s or some such thing as i intently watch x-weighted. love love love paul! There is NOTHING like homemade pizza dough EXCEPT the dough from the ITALIAN CENTRE SHOP in their frozen section – 4 rounds made by Angelo, their famed baker, for under 4 dollars. You can hardly make it for that. Well, you can make it for half of that – but it is wonderful to have on hand. Well, I’ll have to check out Angelo’s dough then. In the past, I’ve purchased dough from Tree Stone Bakery, I think it was/is $2.50 for a single ball of frozen pizza dough. It was delicious albiet a bit whole-wheaty. The trick with frozen dough though, is FORESIGHT…. a person needs to know a few hours in advance what they are having for supper. Me? Not so much foresight, and that’s when my zeal for homemade dough started. It takes no time at all, and kneading dough is one of the best meditative therapies out there. Have you ever tried cooking your pizza on a pizza stone? It simply changed my life when I started using one! You can find it at the italian centre.